Want to receive the CultureNOW newsletter in your e-mail inbox? 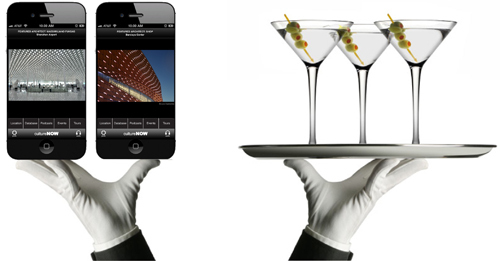 Click here to sign up for our mailing list! We have a new mayor in New York who has begun the process of molding the city into his vision. He has just decreed that we are to have $20 billion worth of subsidized housing in the not too distant future, a worthy goal. 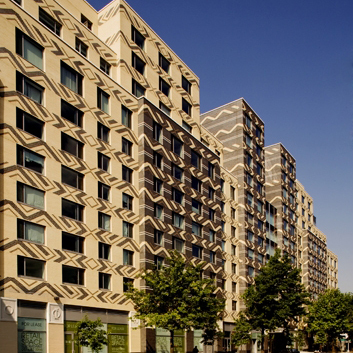 Historically, we have had a bit of trouble in this regard, because most of the people lucky enough to get cheap apartments tend to prefer to age in place. The result is that we have virtually no turnover whatsoever and already require a continuous supply of new units just to keep homelessness at bay. Adding even more promises to be a huge challenge. It will be interesting to see whether Mayor De Blasio can change New York by fiat. We found ourselves standing on Park Avenue twice in the past few days. On Sunday afternoon we led a Jane's Walk, the Municipal Art Society's annual outing to celebrate Jane Jacob's urban vision. The goal was to have a walking conversation (not a tour) with neighbors so that they could be more engaged in impacting the cityscape. Given that the area is a mecca of mid-century modernism which resulted from Gordon Bunshaft's clever interpretation of the setback requirements in the zoning code, and that the Bloomberg Administration's parting shot was the Midtown East proposal to stuff it with even more office space, we wondered where the neighbors would come from. But 20 appeared and we had a provocative afternoon channeling Jane. 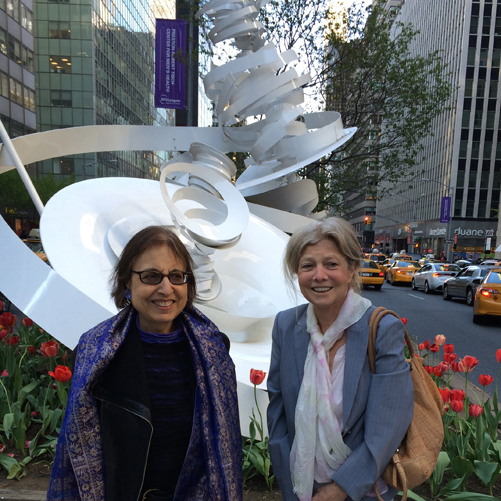 On Tuesday we returned with Alice Aycock to admire her wonderful 10+ block sculpture Park Avenue Paper Chase. What can be accomplished by committed and visionary people is impressive. Salt Lake City named its streets after their distance from Temple Square primarily because the strong-willed Morman pioneers who settled there believed firmly in their divine right to build a city around their church. 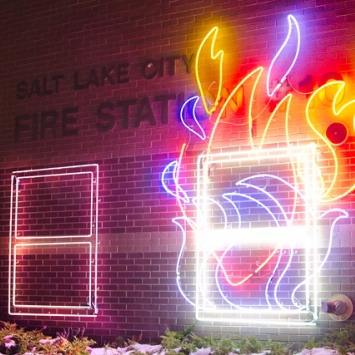 We thought we would celebrate the Salt Lake City Arts Council's Collection. This week's issue of New York Magazine christened Michele Oka Doner one of New York's Seven Grand Dames. 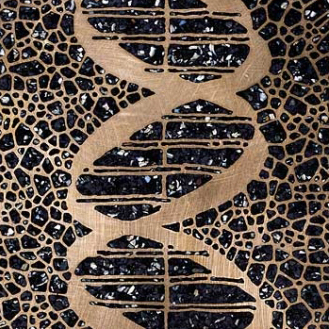 Her work is delicate; many pieces consist of lacy cutouts of natural forms embedded in the structure of buildings. 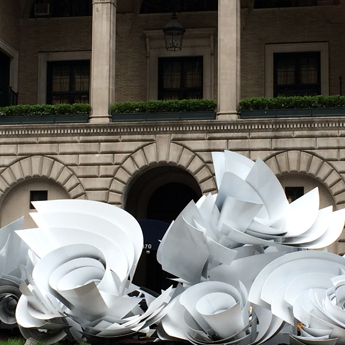 This inspired us to look at other Grand Dames who also create large installations out of fragile materials. We picked Shan Shan Sheng and Kana Tanaka who work in glass and Vicki Scuri who's medium is infrastructure. 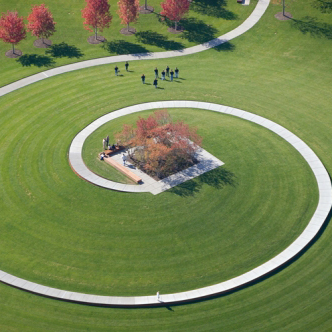 We juxtaposed them with Tom Oslund, a landscape architect who approaches the larger scale by sculpting the land itself. Sadly, we are sorry to say that Fred Schwartz passed away this week. He was there on September 12th when we started thinking about reimagining Lower Manhattan. He loved this city; he loved living and working in it. He was the very first architect to volunteer to make podcasts about his work. He was an extraordinary and amazing man: passionate, visionary, idealistic, articulate, talented, uncompromising, loyal, and definitely a forceful personality. We dedicate this issue to Fred. Geographically Salt Lake City lies in the valley formed between the desert, the Great Salt Lake and the Wasatch Mountains which frame every vista. Centered on Temple Square the wide streets extend for miles based on a coordinate system intended to be prototypical for future Morman cities. In the same spirit, construction began on the Light Rail TRAX system when Salt Lake won the bid for the 2002 Olympics. 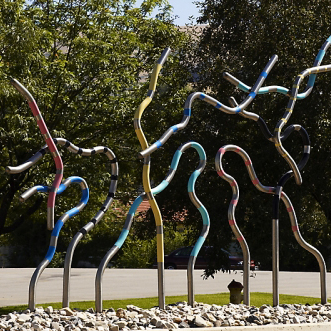 The city has continually expanded the system and is in the process of installing public artworks at most stops. 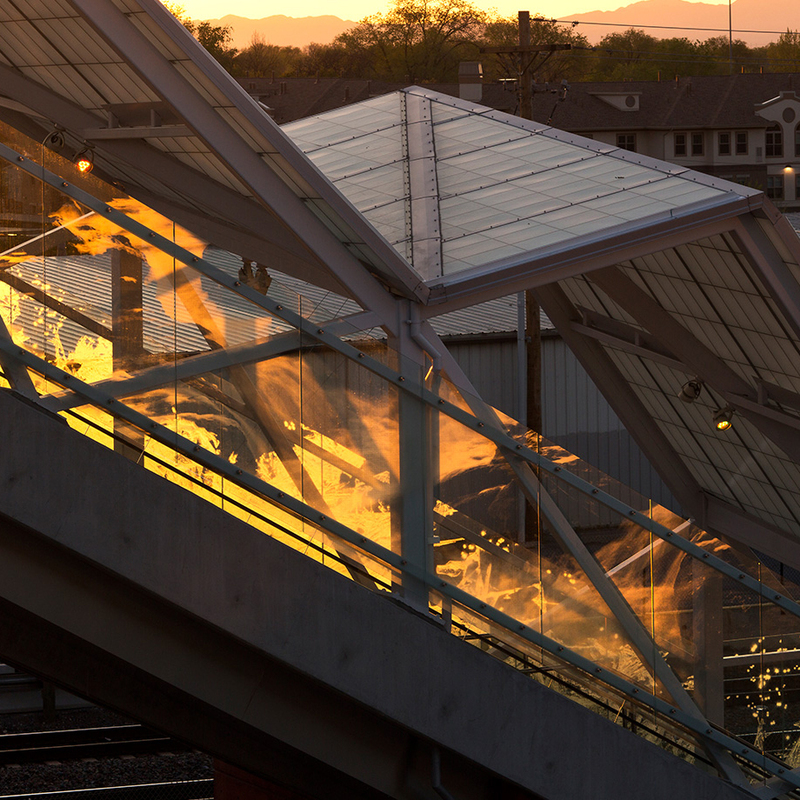 One of the most recently completed is Catherine Widgery's Crystal Light which is an etched glass piece intended to embody the weather patterns along the Wasatch Front at the North Temple Bridge Station. Many cities make a point of hiring local artists. Much of Salt Lake's collection has resulted from this committment. 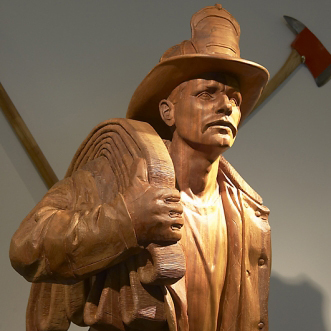 Sylvia Davis received the commission for Answering the Call at Fire Station #1 shortly after completing her degree at the University of Utah; Kazuo Matsubayashi was on the faculty at the time he sculpted Dancing Clowns. 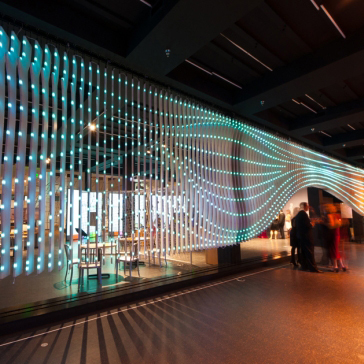 Dynamic Performance of Nature is an interactive piece at the Leonardo Museum; it's not technically in the collection, but it won a Public Art Network Year in Review Award in 2012. 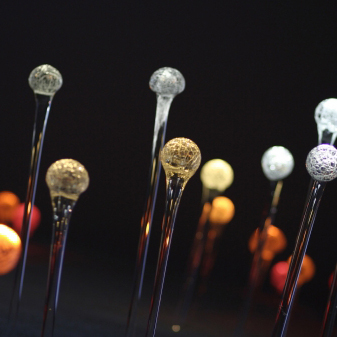 What impressed us about Kana Tanaka is the fragility of her installations formed out of many small glass bulbs suspended in space on threads and nets. They are completely dependant on the shifting light qualities in and their power to transform the ethereal into permanent. Born in Aichi, Japan, Tanaka studied art at the University there before continuing her education at the Rhode Island School of Design. She began as a studio artist creating a series of figure and shifted into a larger scale producing a series of progressively larger installations which use the reflections and transparencies of glass trying to surround the viewer in the sculptures which are inspired by the actual landscapes of their settings. One of the most interesting is Thinking Globally in Human Scale for Central Connecticut State University. 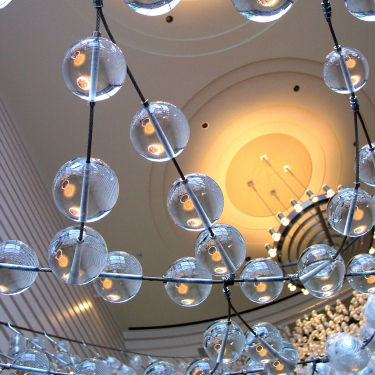 If you look at it from the top, you see lines of blue and white glass beads threaded on wires. From head on there is the outline of a human figure depicting the long history of man inhabiting sacred space. 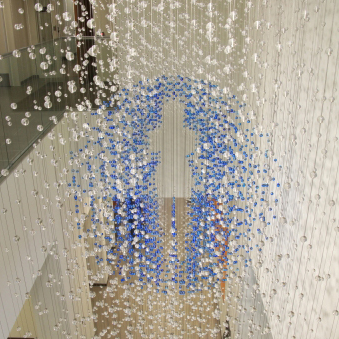 Another work Of Capturing a Moment hanging in the Solano County Government Center is created from a collection of glass beads which are suspended on a net to represent drops of dew on a spider's web. 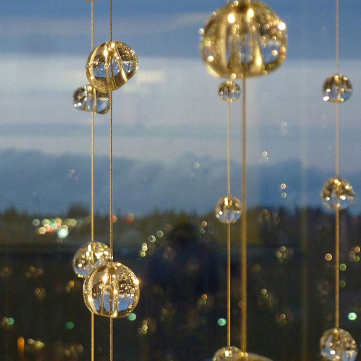 Cascade at Washington State University was inspired by the Spokane River; it consists of thousands of hand-formed water droplets that flow through the entire North Side of the Biomedical Sciences Building. Believe it or not, this is our 15th Cocktails & Conversations program. It is also Design Week in New York. And it is the kickoff for the International Contemporary Furniture Fair. So, we obviously needed to ramp it up. There will be two architects and a journalist. 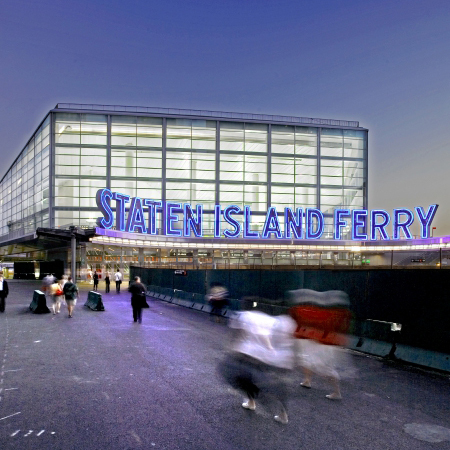 Gregg Pasquerelli of SHoP has two major projects underway on both banks of the East River and Massimiliano Fuksas of Studio Fuksas has designed buildings all over the world including the recently finished Shenzhen Airport. They are paired with Paul Goldberger. It should be a provocative evening. We started the architectural Boat tours in partnership with MoMA when they were exhibiting Rising Currents. 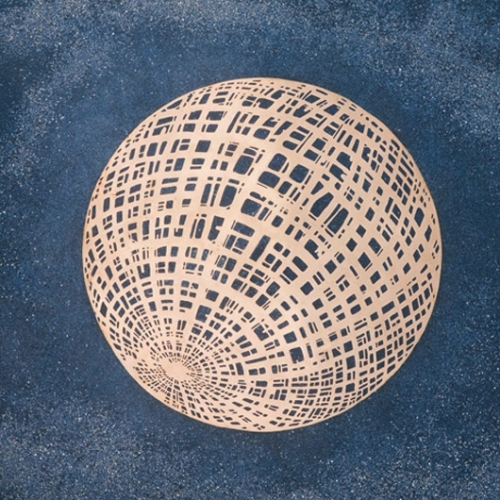 The show depicted design responses to the sea Level rise in the Palasades Bay which was thought to be between 3-6 feet in 50 years. That was 5 years ago and before Sandy. The world has changed substantially and the future has quickly become the present. The extent of the storm surge is shown in light blue. The tour itself has become very popular, so much so that there are about 350+ planned for this year. We have updated the map this month for the fifth time. Michele Oka Doner takes her inspiration from the natural world. It is here that she derives her vocabulary. She grew up in Miami Beach and says that she often walked along the beach collecting shells and debris that washed up from the ocean. She has deep roots in both her city and the art world. Both her mother and grandfather were artists and her father was even the mayor in the fifties. She has also been able to design in many mediums at all scales from jewelry to furniture to sculpture to architecture lending a richness and depth to her work that makes it stronger which is unusual for an artist. Most of her public artworks are deeply embedded in the surrounding architecture mainly in the floors. 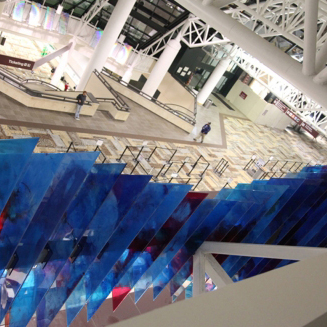 She created a series of terrazzo pieces in transportation terminals beginning with Flight at the Ronald Reagan Airport and Forces of Nature at the Port of Everglades in Fort Lauderdale. 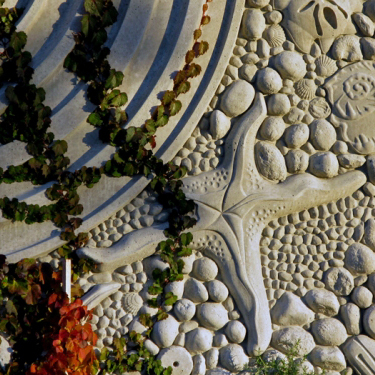 She is most famous for her piece A Walk at the Beach at the Miami-Dade International Airport which is a mile and a half long terrazzo installation that winds through the gate area including about 9000 bronze images of natural forms. It is, for sheer scale, completely spectacular. 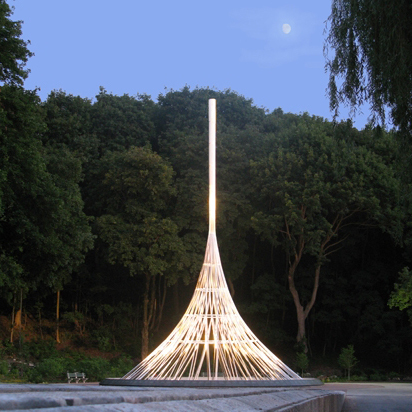 She began working on it in 1995; a second phase opened in 2010. It is also, however, not her only piece at the Airport. 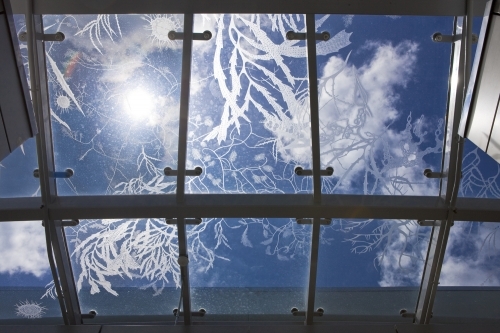 Sargassum is an etched glass skylight over the Intermodal Terminal building. 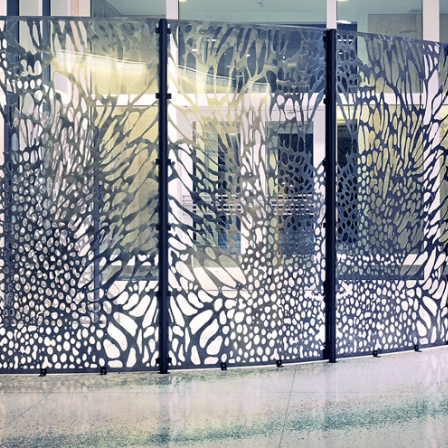 Michele Oka Doner also designed a series of screens including the curving Wave and Gate which is both a security checkpoint and a gateway for the Federal Courthouse in Gulfport. Fred had a huge influence on New York and the architectural profession. A long time resident of Tribeca, he was deeply affected by the tragedy of September 11th. The New York Times credited him with changing the course of post-9/11 planning in a profile, "The Man Who Dared the City to THINK Again." 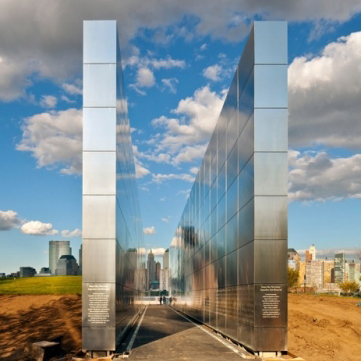 He founded THINK" an international group of architects selected for the World Trade Center Master Plan to "re-imagine Ground Zero" by the Lower Manhattan Development Corporation. That didn't get built, but he did construct several others. We will sorely miss him. Among other biographical facts, Alice Aycock spent 9 years as the artist on the Public Design Commission which is what New York calls its Art Commission. They are tasked with reviewing any proposal that would impact the city's public space and streetscape. "I tried to visualize the movement of wind energy as it flowed up and down the avenue creating random whirlpools, touching down here and there and sometimes forming dynamic three-dimensional massing of forms. 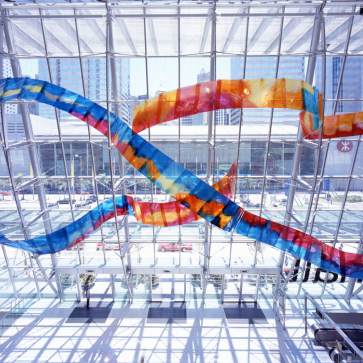 The sculptural assemblages suggest waves, wind turbulence, turbines, and vortexes of energy". We are in the midst of a cultural romance with the new China. Schools are filling up with wealthy Chinese students who are completely fluent in English. Everyone who has a good excuse is rushing abroad to help them build their country. Shan Shan Sheng transitions both worlds. She is, on one hand, very much a product of the Cultural Revolution as she was born in China and came to the US in the early 80's to study at Mount Holyoke and the University of Massachusetts. Because she has one foot planted firmly on both sides of the cultural divide, she moves effortlessly back and forth, creating a body of work in both places mainly in glass. Most of them populate the atriums of large public buildings. 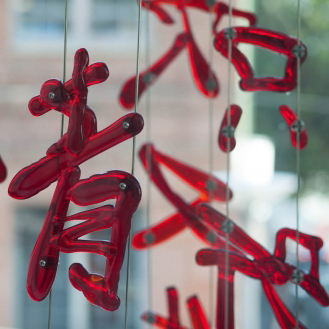 Installed in the Chinese Recreational Center of San Francisco Active Memoryis composed of blown glass calligraphy and emphasizes transparency, language, and memory. Words such as mist, mountain, ocean, railroad, and dream reflect the narrative of San Francisco history and the Chinese American experience in the West. She has had several works hanging in terminals. 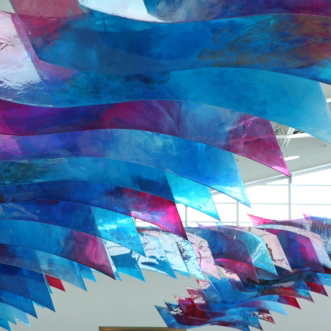 Ocean Waves I & IIsuspended in the Port of Miami Cruise Terminal is meant to evoke travel by sea. Pan American Blue at the Nashville Airport was inspired by a soundwave from the song Pan American Blues performed by Country Music Hall of Fame member DeFord Bailey. We wanted to feature Vicki Scuri because she is an artist who is working in infrastructure and her work is indicative of the range of possibilities in this medium. 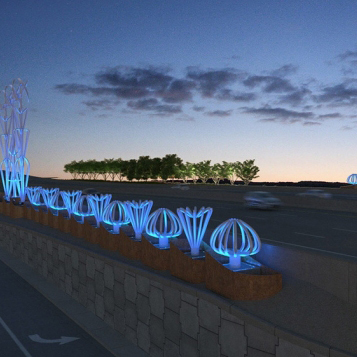 Typically these projects are cosmetic; the artist is tasked with beautifying overpasses which is usually done with a limited pallette of lighting, relief sculptures, and landscaping in the attempt to create an artistic statement that can be read from a distance. The two main themes are 'gateway' and sometimes 'memorial'. For the artist, it requires successfully navigating a lengthy project cycle with large project teams and a lot of value engineering. 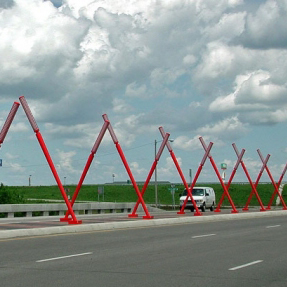 North Ninth is a series of crossed red light poles, meant to mark the entry to the city of Selina, Kansas, a city which would be barely noticeable without this gateway. Another gateway, Airway Gateway marks the entry to the El Paso International Airport on I-10 and the City which is in the throes of finishing the approval process. She has also used infrastructure to create a memorial. 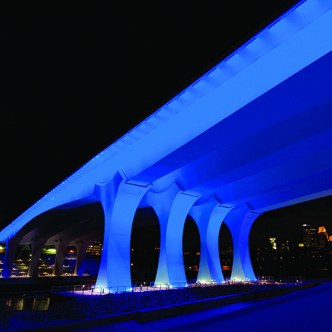 The Blossom Hill Pedestrian Bridge unfortunately was the result of an accident where 2 year old Alexander 'Xander' Arriaga was killed by an Amtrak train in 2005. 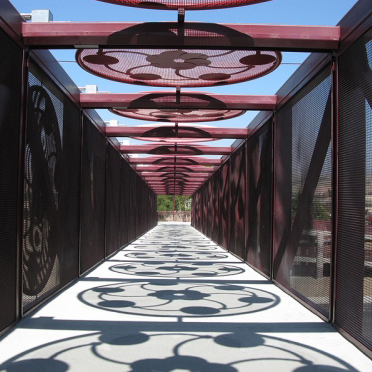 The 'sun bridge of cherry blossoms' is supposed to be evocative of the cycles of life and death and the memory of the former cherry orchards that used to fill the Santa Clara Valley. In Landscape Architecture there are a small group of people who by virtue of the strength of their personalities were extremely influential in the field. What interests us about Tom Oslund is that he has been able to intersect with the generation of greats that included Dan Kiley, Peter Walker, Michael Van Valkenburgh and even Frank Gehry and Claus Oldenburg. This happened partly from his Harvard education, partly from his work experiences and partly from meeting them and becoming friends. 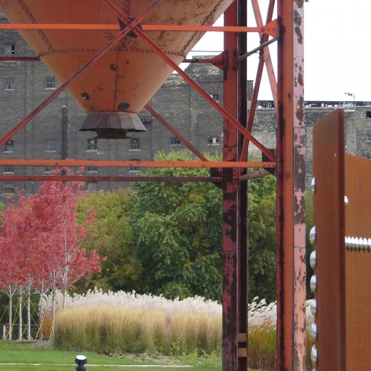 From them he began to look at the landscape as a way of marrying architecture and sculpture and began to explore the different ways that landscapes could be used as a medium for design and how necessary environmental remediation from formerly industrial sites could be repurposed and reinvented into a design feature, an approach taken at Gold Medal Park built on the site of a former salt factory. During the peak of rush hour on August 1, 2007 at 6pm the 35W bridge suddenly collapsed sending 111 cars into the Mississippi River far below. 13 people were killed and many more injured. 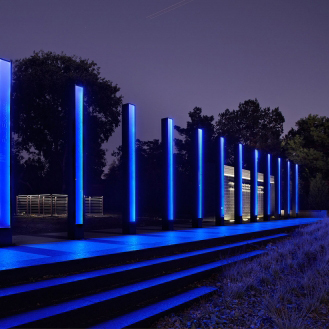 The defacto, if temporary, memorial and gathering place during the trying moments after the tragedy became Gold Medal Park, located just one third of a mile upstream from the bridge. The following year the bridge was replaced with a new much simpler and stronger concrete design 35W Bridge Reconstruction . Land for the memorial 35W Remembrance Garden was made available on the Mississippi with views of the bridge; it was opened on August 1, 2011 four years after the tragic event. Having the opportunity to shape three iconic landscapes within a few blocks of each other in your own hometown is rare for anyone and gave Tom Oslund the chance to transform Minneapolis.